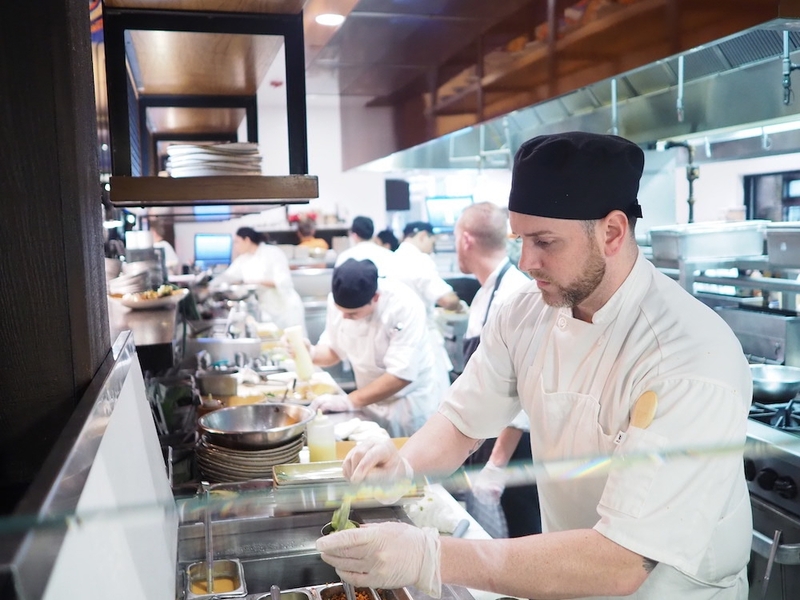 His highly rated Public Television series, Mexico–One Plate at a Time, is broadcast coast to coast and has earned him multiple Daytime Emmy nominations for Best Culinary Host. 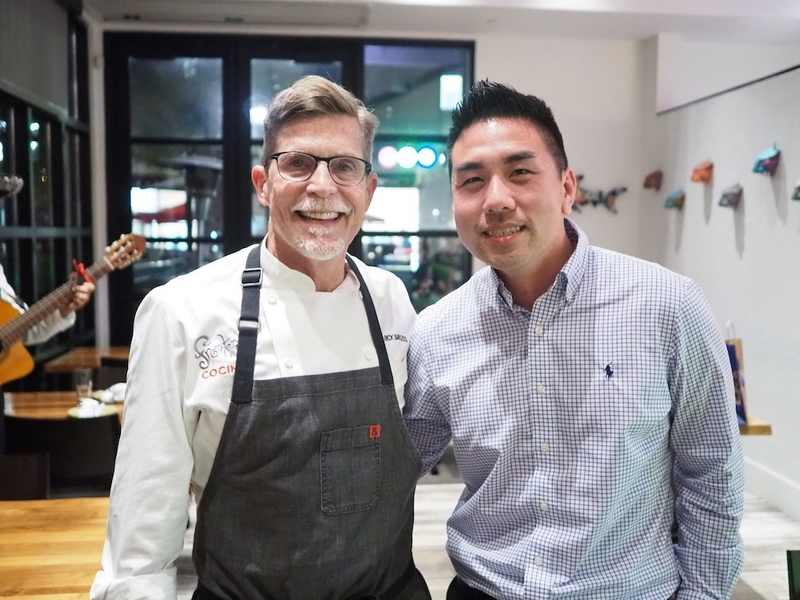 His casual restaurant Frontera Grill was founded in 1987 and received the James Beard Foundation’s highest award, Outstanding Restaurant, in 2007. Frontera Cocina brings to Disney Springs a contemporary Mexican experience with warm colors, an open kitchen and a lively atmosphere. 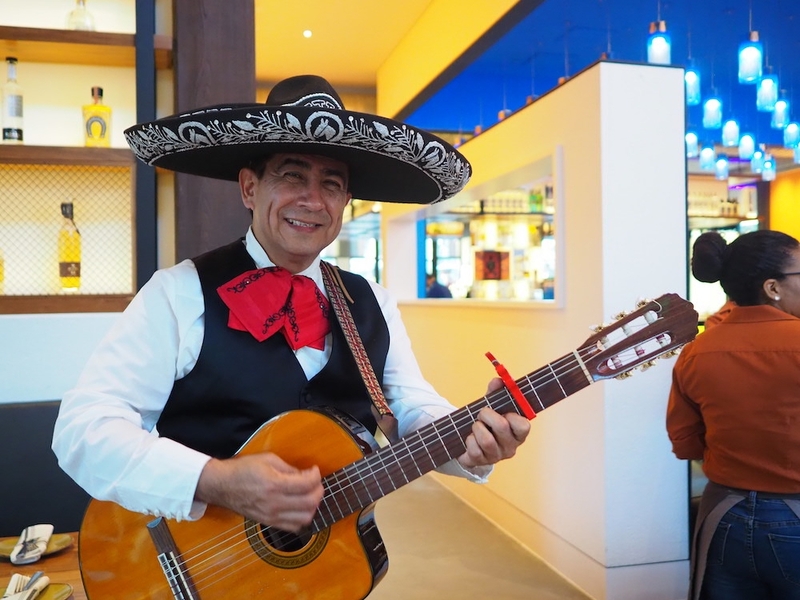 We were recently invited to taste items from the new Taste of Mexico City menu along with some winter seasonal offerings at Frontera Cocina. 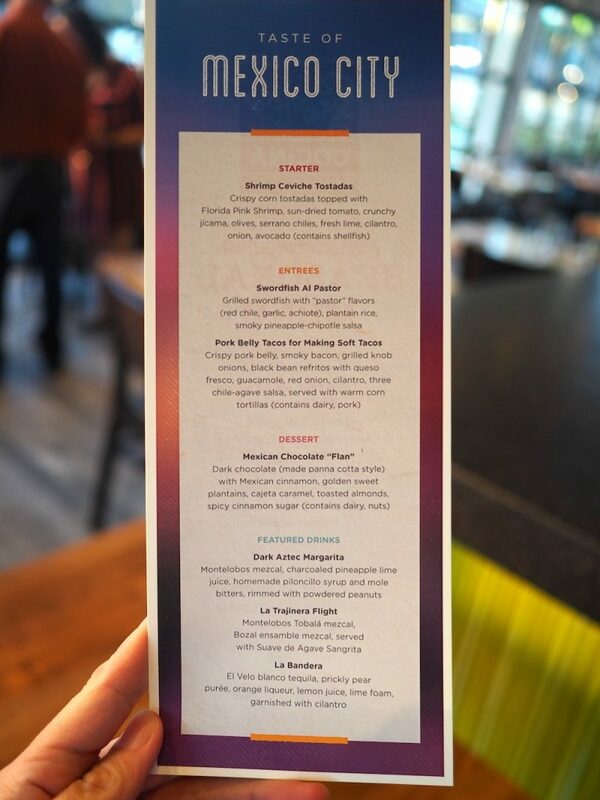 Here is a look at some of the drinks available from the new menu. 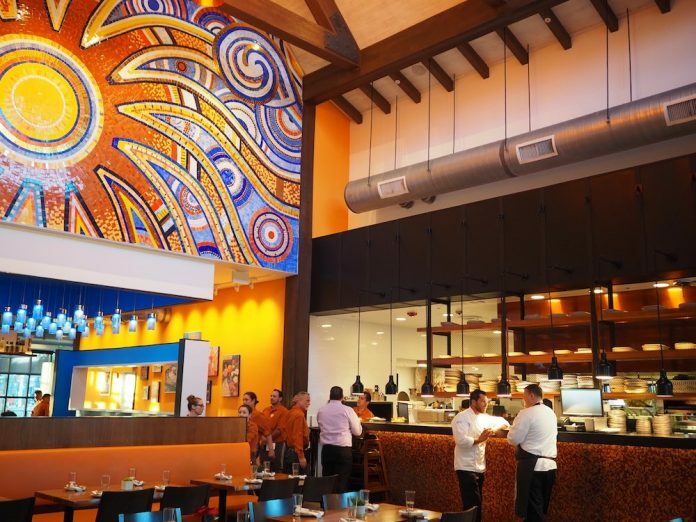 The people behind Frontera Cocina are also related to the folks at La Cava Del Tequila at Epcot’s Mexico Pavilion so you know their bar program is top notch. 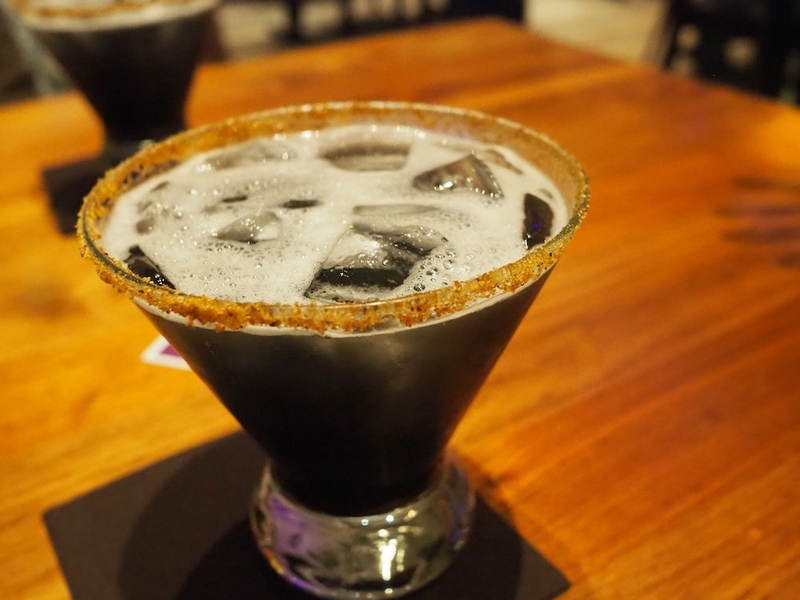 The Taste of Mexico City features the Dark Aztec Margarita with Montelobos mezcal, charcoaled pineapple lime juice, homemade piloncillo syrup and mole bitters, rimmed with a powdered peanut rim. La Bandera, is a fruity sweet cocktail of El Velo blanco tequila, prickly pear puree, orange liqueur and lemon juice finished with a lime foam and garnished with cilantro. 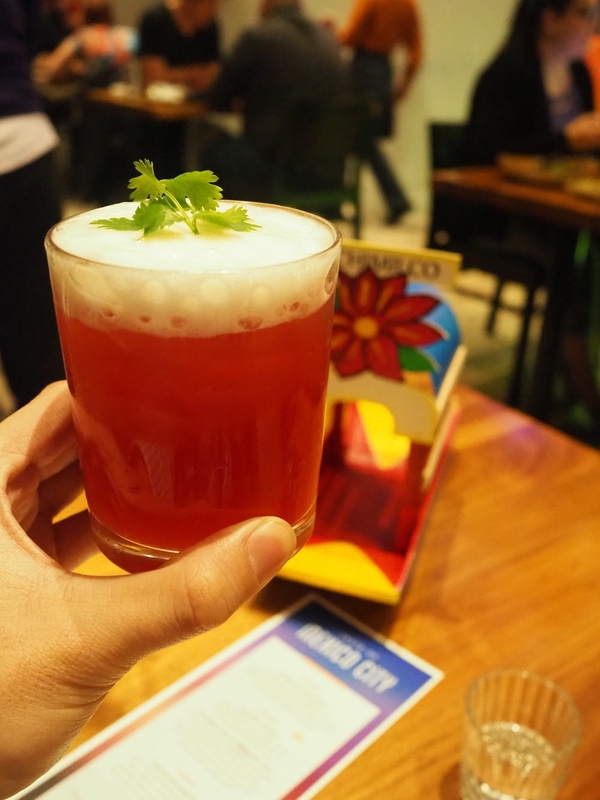 The prickly pear stands out in this drink with a nice citrus touch. 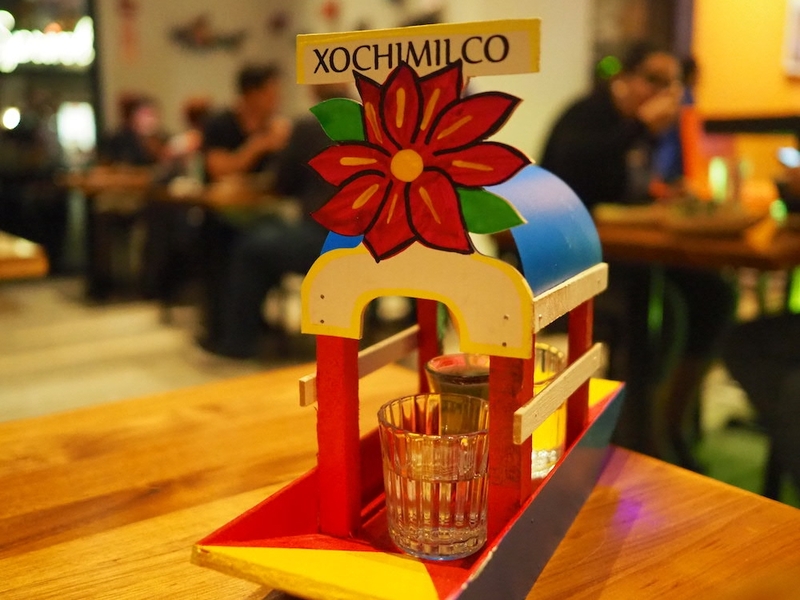 La Trajinera Flight is featured on a “trajinera”, a gondola-like boat famous in Xochimilco, a scenic borough within Mexico City known for its canals. The Flight consists of two shots of mezcal (Montelobos Tobala and Bozal ensamble) served with one chaser shot of Suave de Agave Sangrita, a sweet juice-y sangrita shot made from agave. 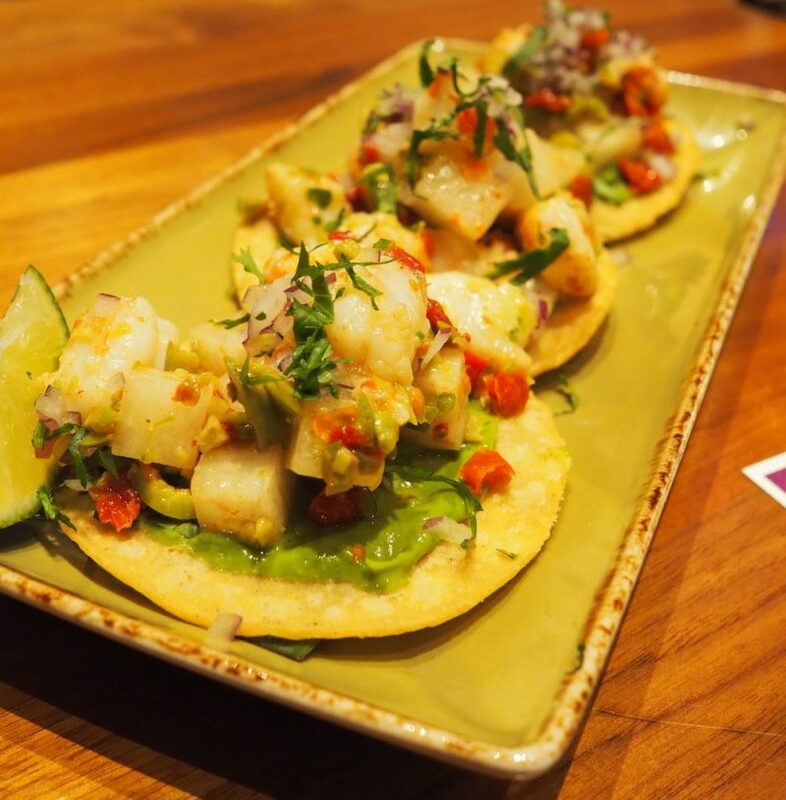 The Shrimp Ceviche Tostadas had lovely crunchy jicama chunks in it that were sweet and juicy like apple bites, pairing well with the Florida Pink Shrimp and lime. 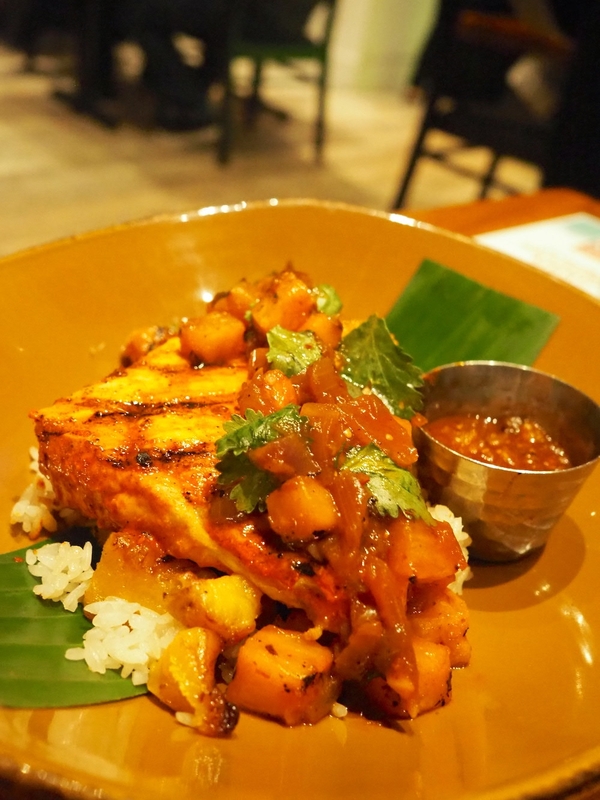 This swordfish was one of our favorite dishes of the night, marinated just for an hour in red chile, garlic, and achiote – the dish was superbly tender and flavorful. I thought it was cooked sous vide, but chef told us it was simply marinated and then grilled. Excellent! The pork belly here had a crispy texture to them yet were tender enough for a taco. 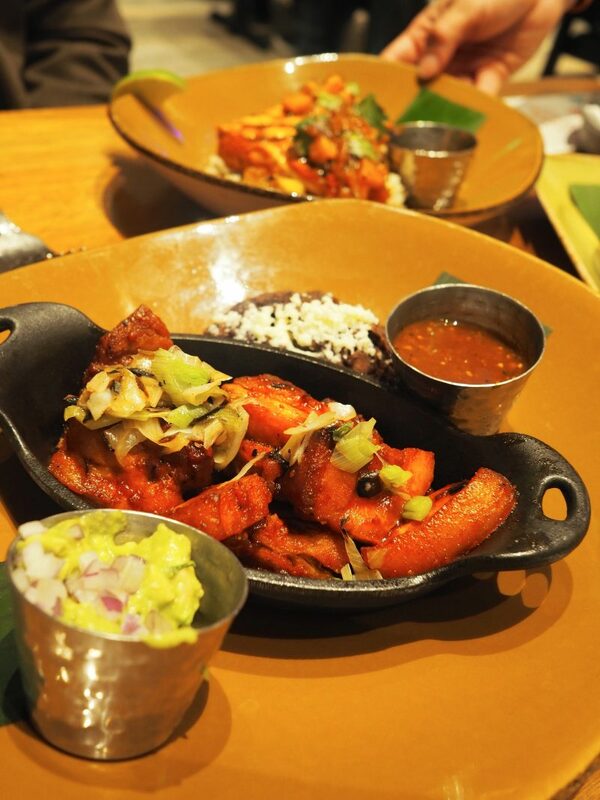 The flavor was a sweet Mexican barbecue type of flavor and paired well with the black beans and the smokey three chile-agave salsa. Winter Green Ensalada – Shaved black kale, Arcadian lettuce, grilled pineapple, toasted pepitas, Cotija cheese, red onions, jicama, roasted tomatillo-serrano vinaigrette. 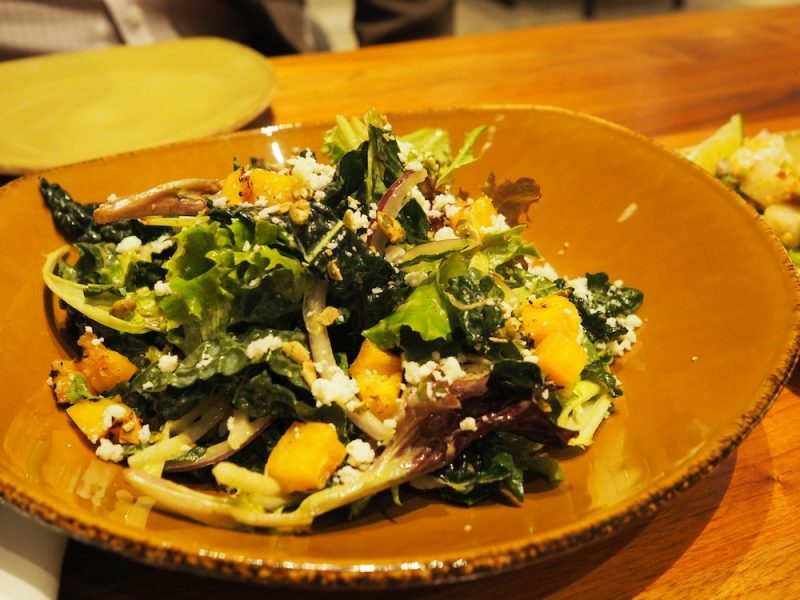 This salad brought the earthy flavors of kale together with the sweetness of pineapple, and spiciness of the serrano pepper sauce. 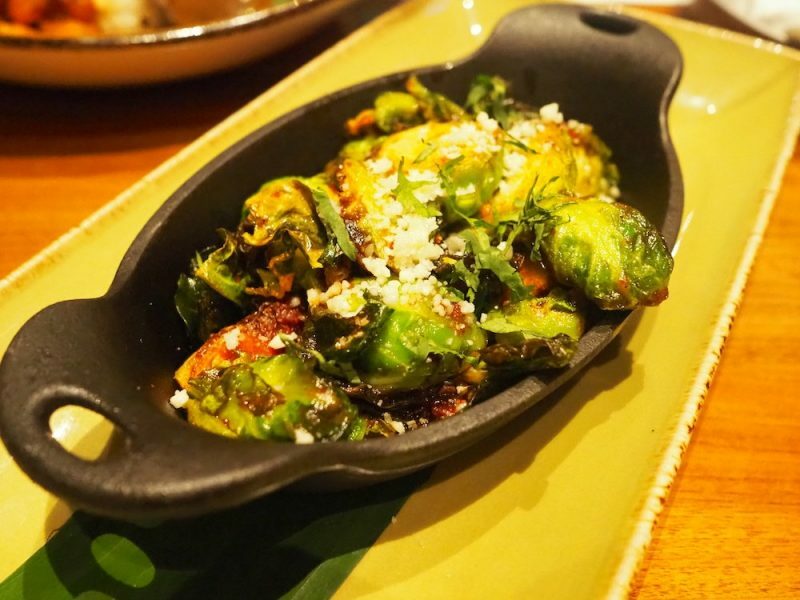 Three Chile Roasted Brussels Sprouts with crispy bacon and Cotija cheese. 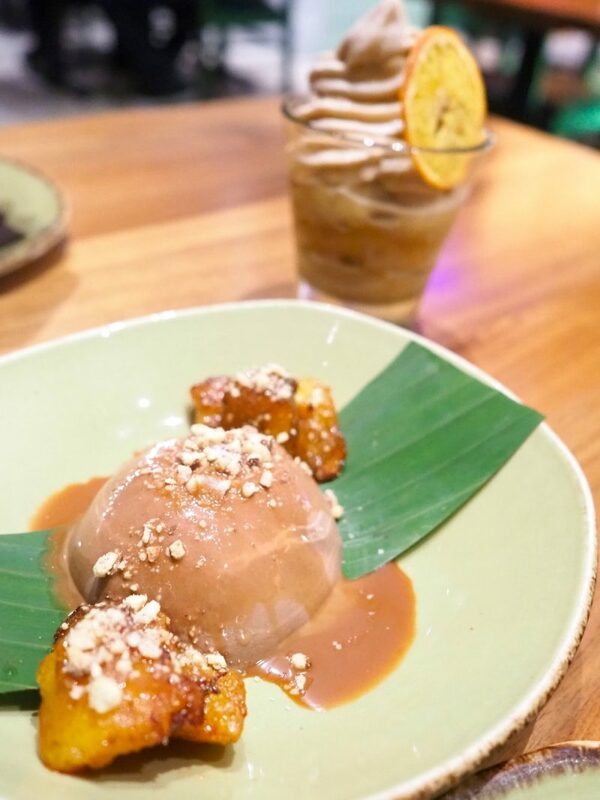 Café de Olla Sorbet – A blend of Mexican coffee, brown sugar, cinnamon, clove, and orange zest. 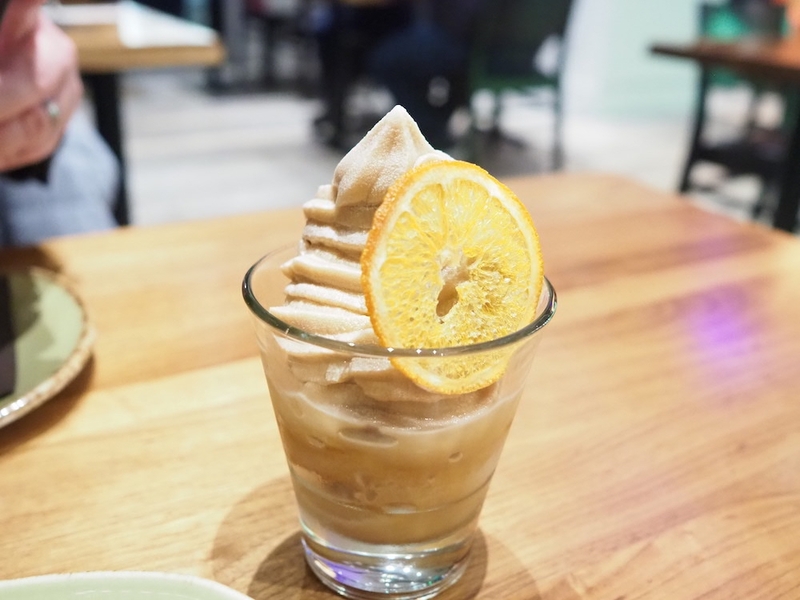 I loved the crunchy crystal orange zest with the frozen Mexican coffee sorbet and touches of cinnamon and clove in this dish!